The sigmoid function is so-called because it is shaped like one form of the Greek letter Sigma. Its purpose, within an artificial neuron, is to generate a degree of non-linearity between the neuron's input and output. 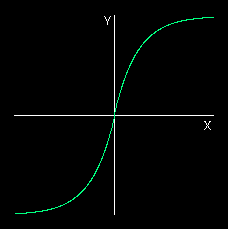 The basic formula for the sigmoid function above caters only for 'real' values of x from −1 to +1 and produces an output f(x) over the range 0 to +1. The enhanced version below provides a bipolar output over the same range as the input. This version of the formula also rescales the input and the output to a range of −32767 to +32767 which is the range of the 16-bit integer native to the machine used on this project. Since we need only 16-bit precision in the output, y can be a 16-bit int. The exp() function takes a floating point double argument, and would therefore force the result of the multiplication and division to a floating point double. However, in order to preserve the 16-bit precision of the input through the calculation, we must cast x to a floating point double before multiplying it by K and subsequently dividing it by R.
We shall now build this formula into a 'C' function we shall call Sigmoid(). Unfortunately, this function was found to take 5·4 milliseconds to execute on an 80286 PC. Since it is at the very time-critical centre of a network, this is unaccept­ably slow. A very small increase in speed is possible by placing the formula directly into the neural network function as a single statement, but the gain is almost imperceptible. A better solution is vital. A vast speed improvement would obviously be achieved if all 32768 plots covering the range of the 16-bit input and output values were placed in a look-up table. However this would require 64k of memory to hold the table which is also un­acceptable. A compromise is to have a smaller table and use linear interpolation to find values of f(x) for values of x in between two of the spot values of x for which table entries have been made. The table is chosen to have 1025 entries. This is one more than the range of values 0 to 1023 inclusive since the method needs a final plot beyond the extremity of the range to act as a reference for the last valid plot. To make best use of 16-bit interger precision, this is implemented as a table or array containing the 1025 values of f(x) which correspond to 1025 values of x which are multiples of 32. Thus x ranges from 0 to 32768 ie: 0, 32, 64, 96, 128, ... 32736, 32767. The final entry is set to 32767 instead of 32768 to avoid overflow. This function returns the required value of f(x) in less than 21μs. This is 256 times as fast as the formula. It only disagrees with the formula in the least significant of the 16 bits in only 40% of cases (a maximum error of 30 parts per million). The 256-fold speed gain is merely at the expense of an extra 2k of memory to hold the look-up table. Speeds were measured on an IBM PS/2 Model 30-286 (without an 80287 math co-processor). print"NEURAL TRANSFER FUNCTION FOR A MULTI-LAYER PERCEPTRON"
locate  8,12 : print"SIGMOID FUNCTION"
locate 16,45 : print"f(x) = 2/(1+exp(-k*x)) - 1"
locate 17,45 : print"x = neuron activation level"
locate 18,45 : print"f(x) = neuron output level"
v! = RR! / (1 + exp(-w! * 32 * k / R!)) - R! locate 23,4:print"TIME:"; TIMER - start! ;"seconds"
' v! = RR! / (1 + exp(-w! * k / R!)) - R! This function exercises the look-up table function for 4 different values of k. It can also compare the execution times of the exp and the look-up method and measure the maximum error of the look-up method. Load sigmoid.bas into a QuickBASIC environment and compile and execute it. This will exercise the QuickBASIC version of the Sigmoid function and display the graph­ical results. You can alter the code in order to experiment with the program. Always 'comment-out' the display statements in the Sigmoid: subroutine when doing time trials as they are themselves time-consuming. Note that the speed advantage in BASIC between the exp function and the look-up table is nowhere near as much as it is in 'C'. QuickBASIC is a very quick means of getting a prototype like this working and visible. However you cannot use BASIC to optimise efficiency and speed since it does not provide the almost direct control of the CPU that 'C' does. 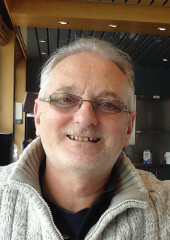 An exerciser for the 'C' version of Sigmoid() was therefore written and exercised within the Microsoft Programmer's Workbench development environment using Microsoft C 6.00 as follows. This source code is contained in the file sigmoid.c and its executable version is in sigmoid.exe. Run sigmoid.exe to exercise the 'C' version of Sigmoid(), or load sigmoid.c into the Microsoft Programmer's Workbench then MAKE and RUN the program. You can modify the code yourself and experiment with it. I later upgraded to Linux where I use the gc compiler. This code is tuned for maximum performance for k = 8. 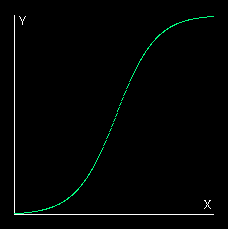 Notice particularly that RR is a little bit more than twice R. In fact it is 22 more than 2 * R. The sigmoid function computed from the exponential formula only reaches its maximum value of 32767 when x reached infinity. To avoid a progressive loss of range across the multi-layer network, x is therefore accentuated slightly so that f(x) hits 32767 precisely when x does. See source file siggen.c and executable siggen.exe. Because of its time-critical position at the very centre of the innermost loop of the Multi-layer Perceptron neural network function MLP(), great effort has been made to make Sigmoid() as fast as possible. This won't work on machines that use complement arithmetic and masks must be compatible with the machine's word-length. A 16-bit word length is assumed above. The function becomes quite machine-dependent, but the extra speed could be worth it if you do a lot of network training runs. This however had the opposite effect due to the time taken up by the extra if statements. The optimum size of look-up table was therefore 1024 giving a firm value of f(x) for increments in x of 32 with a maximum error of ±1. Nothing was gained by using larger tables since the error in the least significant bit would be present anyway from binary rounding errors on the shifts and multiplies. Besides this is only an error of 30 parts per million which is better than the inputs originating from most input sources. Smaller tables started to allow the linear interpolation errors to creep in rather rapidly. The sigmoid is the ideal non-linear transfer function for the multi-layer perceptron. However, there are other kinds of neural network topologies in which different non-linear transfer functions work better. For instance, in the Radial Basis Network top­ology, the Gaussian (or bell curve) function is used. This function, together with a test exerciser are available in gauss.c (executable in gauss.exe) and gauss_test.c (executable in gauss_test.exe). a bipolar sigmoid in which both x and y range from -1 to +1. Which type of sigmoid is produced is determined by the content of the 'param' tag within the 'applet' tag used to invoke the applet. The code of this applet could easily be extended to include the generation of the look-up table previously done by the 'C' program described in the text.